The rugged, snow-covered Sawtooth Mountains jet out in front of the orange sky during a vibrant winter sunset. You stare in awe at the menacing yet beautiful summit, wondering if you are the only photographer witnessing this spectacle. This is what it’s like during the cold, crisp winter season in the uncharted land of Idaho, a state with more forest land, wilderness, and white water than any other in the country outside of Alaska. Before I moved to Idaho earlier this year, I spent a month road tripping through the entire state in search of powder to ride and amazing landscapes to photograph. I easily found both on day 1. And it lasted for 30 more days. The journey only ended when I had to return to see my family for Christmas. With another winter just around the corner, I cannot wait to wax my snowboard and charge up my camera. There is nothing like a winter in Idaho. Idaho, located in the northwestern region of the US, is a relatively easy state to get to though travel may not be the cheapest compared to other domestic flights. The state capital, Boise, isn’t a major airline hub, and flights often require layovers, even when departing from major cities. United is the only airline that runs nonstop flights from San Francisco—my current residence—and the roundtrip price is about $350. If you want to cut your cost to $200, you can add a stopover that turns your travel time into a little over five hours. Ten hour, one-stop flights from New York’s JFK are priced at about $400 round trip. However, if you’re not flying out of a main travel hub, prices can easily exceed $500 if not booked far in advance. Regardless, you should plan on taking a road trip through the state, so flying into Spokane, WA or Missoula, MT is also an option. In Idaho, it’s all about the road trip. During the winter months, you must be prepared for extreme winter driving conditions that can appear out of nowhere. An SUV with full-time AWD or part-time 4WD is highly recommended. A standard SUV from most major rental agencies will set you back about $50 per day, not including taxes and fees. A full-size SUV costs around $70, while a Premium SUV is about $100. But when driving in harsh conditions, especially if it’s not within your comfort zone, the extra traction and safety of higher-end models is well worth the extra cash. Winter in Idaho can be unpredictable, especially in the current age of bizarre weather patterns. While the rest of the country was unusually warm and dry throughout 2015, the winter in the Northwest was off to a blistering start. So if snow-capped mountain peaks are important for your photographs, it’s best to visit late in the winter as the snow continues to accumulate. However, while December typically sees the highest rate of precipitation, high snow patterns in January and February also provide incredible conditions for photography, as well as great days for skiing and snowmobiling. But on the off chance that you don’t experience the classic winter wonderland you’re seeking, the landscapes and lack of crowds will nevertheless make for a memorable trip. Boise is Idaho’s capital city and home to almost a quarter million people. This is the ideal starting point for your Idaho road trip, but don’t just use it as your launch pad. The town has a trendy, up-and-coming restaurant and bar scene, and is the center of Idaho’s budding brewery renaissance. Most of the restaurants and nightlife are located in the downtown area, but Hyde Park is also home to an entertaining scene in a beautiful neighborhood. And if you happen to be here in late winter, the incredibly fun five day Treefort Music Festival runs from March 22nd-27th, 2017! 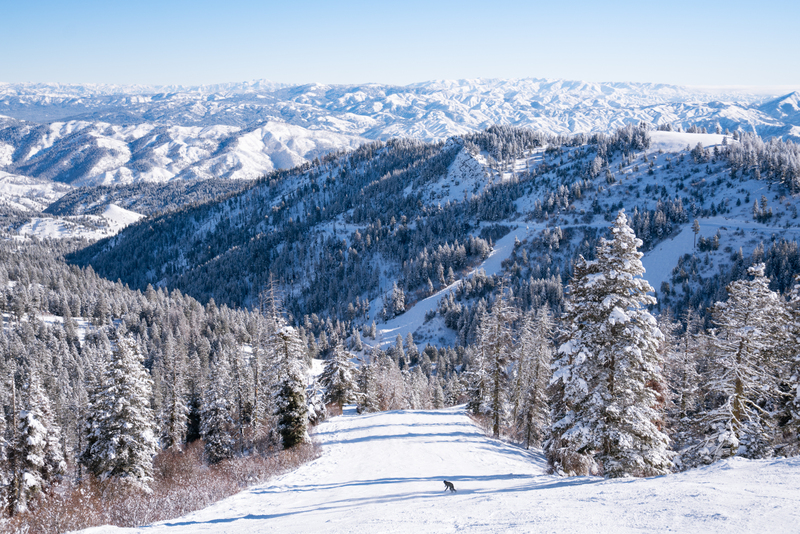 Only 16 miles north of Boise lies Bogus Basin Mountain Recreation Area, a common spot for local skiers and snowboarders. With an elevation range of 5,790 to 7,582 feet, the mountain always gets great snow during active winters. Additionally, the road that winds up the mountain is lined with dramatic lookout points to set up your tripod for sunset photos. Idaho has some of the most pristine wilderness in all of the US, and since the state isn’t home to a national park, it often comes without crowds. Much of the wilderness is managed by federal agencies such as the Bureau of Land Management and US Forest Service, with 30 state parks that welcome over 4.5 million annual visitors. One of the most memorable winter experience is an overnight stay in the parks’ wilderness yurts, which sleep up to six people and are accessible through a two to three-mile snowshoe hike. Book a backcountry yurt at on the Park’s Website or call 1.888.922.6743. Ernest Hemingway spent five consecutive autumn seasons in the Sun Valley area, which propelled the region as one of the most beautiful year-round resort areas in the US. In the summer, the resort village of Sun Valley and the nearby town of Ketchum offers mountain biking, golf, and hiking, but the winter season is when the area truly shines. Steady storms and freezing temperatures create soft snow that makes the 3,400 foot vertical drop on Bald Mountain perfect for skiers and snowboarders of all skill levels. Also, be sure to take the gondola on Bald Mountain up to the Roundhouse. The view is incredible at any time of the day, but be sure to catch at least one sunset, as the sky lights up in orange and pink. It’s the perfect backdrop for shooting the snow-covered mountains in the foreground. Additionally, Sun Valley is a known getaway for celebrities who own vacation property and are often sighted on the slopes. This makes Sun Valley one of the most expensive places in Idaho, while cheaper food and accommodations can be found just 12 miles south in the charming town of Hailey. Stanley is like a tale of two cities, or in this case, two small towns. During the summer, it’s the bustling jump off point for the Sawtooth Wilderness, a backpacker’s heaven, while the Salmon River flows along the highway and keeps the river rats happy. But the winter tells a different story in Stanley. Cold temperatures and heavy snow limit tourism, leaving only the town’s 63 residents (although some of them leave for the winter as well). However, this is when Stanley transforms into a photographer’s paradise, as the jagged, snow-covered Sawtooth Mountains provide a perfect foreground for the swirling orange clouds after a brief afternoon storm. From town, if you drive east on Highway 75, the icy blue Salmon river turns a casual drive into a full-day photography adventure. Just don’t forget your neutral density filters for long exposures to make the water look dramatic and smooth. Also, look out for hidden hot springs to warm up in as you watch the snow fall over the charging river. Cascade sits along the shores of Lake Cascade, Idaho’s fourth largest lake with a surface area of 47 square miles. In the winter months, it’s as if the lake was made for photography, as the snow and wind form patterns on the ice that looks incredible in sunrise, sunset, and night photography. Though it’s also used for ice skating and ice fishing, be sure to talk to the locals to find out if it is safe to walk on it. Then, after you check out the lake from the main viewpoint at the end of Old State Highway, drive north to find rock croppings and other views for more unique photographs. Additionally, Cascade is close to Tamarack Ski Resort, an attractive vacation destination that has seen major improvements throughout the past year. McCall is a tourism-driven town that lies on the south end of Payette Lake. It’s often referred to by ex-Californians as “Mini Lake Tahoe” and it’s easy to see why: the lake sits at 5,000 feet above sea level and is filled with crystal blue water. Half of it lies in Ponderosa State Park, and is home to 1,000 acres of wilderness campsites and hiking trails along the shore. Additionally, the lakeside town is full of restaurants, bars, wineries, and breweries, so there is never a dull moment in McCall. Winter activities such as skiing, snowshoeing, fat biking, and snowmobiling are also abundant, making McCall a popular year-round destination. Syringa isn’t as much of a town as it is a region. Located close to the 1.3 million-acre Selway-Bitterroot Wilderness Area, it is remote and quiet, especially in winter after the world-class rapids of the Lochsa River have died down. However, this calmness makes for incredible winter photography, as the snow covered banks are visible through the dramatic fog that comes and goes throughout the day. From the Reflections Inn, drive east along Route 12 and be sure to have a full battery in your camera, as you will stop to shoot quite often. And for a side trip, take a right at Three Rivers Junction to drive along the picturesque Selway River. Gritty, tough, and historical, Wallace is a gem that can’t be missed. With a population of 784, the town has a fascinating history of silver mining, brothels, fires, floods, and violent warfare between miners and mine owners. As a result, the locals are full of pride and for good reason; they have endured tough times and always come out on top. For example, in the 1970s, the federal government attempted to wipe out the town’s historic downtown buildings with the I-90 freeway. But before it could be built, city leaders placed the downtown area on the National Register of Historic Places, which forced the feds, at great expense, to reroute the freeway and elevate it. Today, there is a downtown manhole cover that proclaims the town is the “center of the universe,” and to the good people of Wallace, it is indeed the center of the universe. In the far North of Idaho lies Sandpoint, a 63-mile drive from the Canadian border. Built on the shores of Idaho’s largest lake, Pend Oreille, Sandpoint’s economy takes advantage of its access to fun and adventure. During warmer months, the 43-mile lake is buzzing with boaters, many of whom are learning the favorite local sport: wake surfing. The lake itself is extremely photogenic, and there’s an incredible walking trail that runs over a bridge on I-95 where you can watch train run over the lake on elevated wooden tracks. But the fun doesn’t stop in winter, as Sandpoint is surrounded by three mountain ranges: Selkirk, Cabinet, and Bitterroot. Also, make sure to visit Sandpoint’s pride and joy—a miniature replica of the Statue of Liberty located in Sandpoint City Beach Park. This is a great scene to photograph during winter sunsets, as the statue and the snow-capped mountains in the background glow in an array of vivid colors. Get your camera ready to be blasted with snow, as the Schweitzer Mountain Ski Resort was made for ski photographers. On clear days, the mountain overlooks Lake Pend Oreille, and it is filled with frozen trees known as “snow ghosts” that can serve as the perfect backdrop for winter sports photography. But don’t spend too much time with your camera, or you will miss out on Idaho’s largest ski mountain, an absolute blast and a healthy dose of powder. In fact, if you’re looking for untouched powder, the Selkirk Powder Company team can bring you to the closed-off backside of the mountain for its world-famous cat skiing. 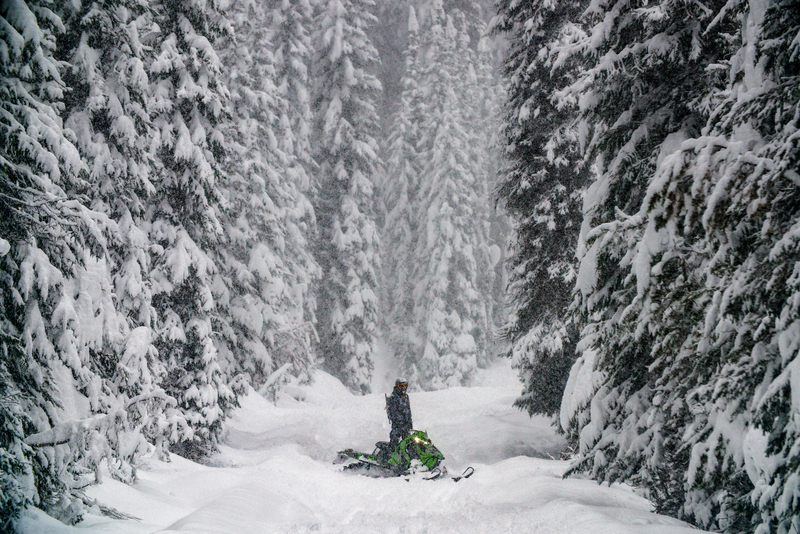 Then, after you’ve carved fresh powder all morning, you can hop on a snowmobile tour that runs deep into the 30,000 acres of remote wilderness. The photography and adventure opportunities at Schweitzer are endless, so plan on spending some time here. There is no “z” in Boise, yet most outsiders say “Boy-zee.” It’s pronounced “Boy-see” so make sure you enunciate it correctly. The locals will nevertheless know you aren’t from the area, but at least they will compliment you for trying. Winter in Idaho is no joke. Outside, the only time you will feel any form of heat is when you’re in one of the 340 hot springs scattered throughout the state. Most nights and some days will never be above freezing temperatures, so dress appropriately. Thermals and insulated jackets are a must-have, and always be ready with a spare set of socks, as even the most waterproof boots can’t handle some of the deep snow found in the state. Black ice, blowing snow, and high winds can make winter driving in Idaho a nail-biting adventure. A trusty 4WD truck or SUV is recommended, but even with a winter vehicle, drive slowly and carefully. Conditions become far more treacherous after the sun goes down and temperatures drop, so only drive at night if it’s absolutely necessary. Between the hazardous driving conditions and remote locations, always have a first-aid kit and emergency food and water close to you in your vehicle. If you swerve off the road and down an embankment, there is a good chance you won’t be found for a while. Idahoans are proud of their state, but they are also very protective of it. They are happy to be undiscovered, as most vacationers and photographers usually flock to the neighboring states. So if you are looking for that hidden hot spring, you probably won’t get much help if you simply ask someone. But if you get to know the people and engage in conversation with them, then you are more likely to learn the local secrets. Plus, in most cases, they will be full of intriguing stories as well. Idaho isn’t known for healthy food, and the restaurant owners and chefs pride themselves on just that. Expect a lot of delicious deep-fried food and strong craft beers, and prepare to buy a larger winter jacket halfway through your trip. Deer, elk, moose, and bears are just some of the large creatures roaming the vast wilderness in Idaho. Always be aware of your surroundings, especially if you’re shooting at night. These animals can be very aggressive if they feel threatened or spooked. During the day, keep your eye to the sky as the Bald Eagle population peaks in January and February. Often, these impressive birds gather near rivers, lakes, and shorelines in search of food.